The buyer urgency created by constant housing news coverage and ever-changing housing payments from rising rates is unmistakable. Last week, the Federal Reserve raised short-term rates for the second time in 2018. And, while we’ve mentioned time and time again that it is important to pay attention to Fed policy, it is also critical to remember the relationship between mortgage rates and 10-year Treasury yields. Luckily, after crossing the feared 3% threshold at the end of April, yields continue to be range-bound between 2.8% and 3.0%. This has helped stabilize mortgage rates, which currently sit around 4.6%. 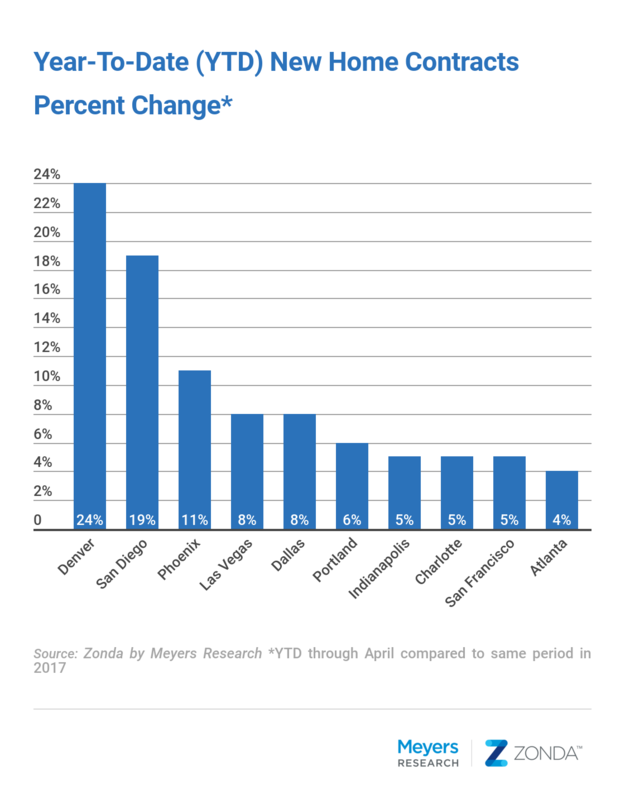 Our Director of Economic Research, Ali Wolf, wanted to understand how sales activity across the country has responded to higher rates and dug into Zonda to find the answer. We pulled contract sales data to see the biggest year-to-date winners of 2018, which include Denver, San Diego, and Phoenix. Coming in at number one for the greatest growth in sales is Denver. This market has dominated news cycles for its rapidly changing fundamentals. When looking at affordability, we like to break markets into different categories. In 2010, Denver was bucketed with the moderately affordable markets like Raleigh and Atlanta. Today, the metro now falls under the least affordable category, playing in the same league as Seattle, Miami, and Los Angeles. Denver new home closing prices grew 42% from 2012 to 2017, reaching just under $500,000. This is all while the median household income is just over $75,000 and the current unemployment rate is 2.8%. “In metro Denver/Boulder, April year-to-date sales over $400K were up 13%, while contracts for homes priced under $400K grew 41%. 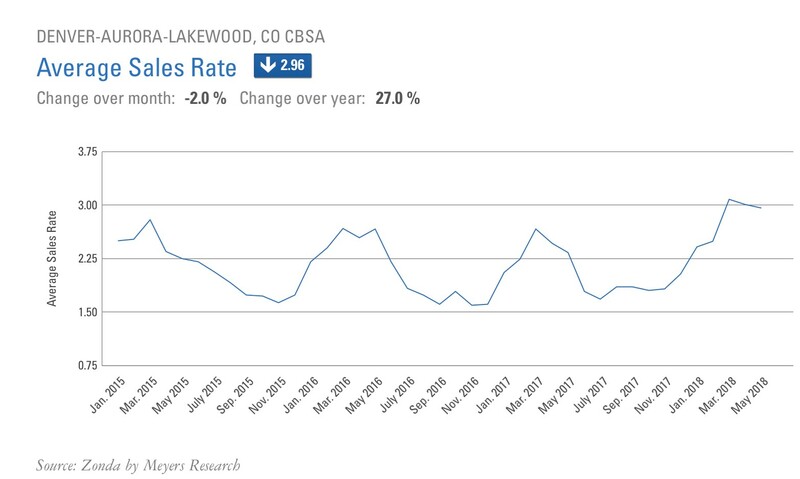 We will watch to see if rising rates shift demand more towards lower priced homes,” explains our Senior Vice President of Advisory and Denver expert, Mike Rinner. Even as fundamentals change, sales in Denver are strong. Like most markets, sales historically pick up during the spring selling season, but in Denver, the spike was nearly 30% this year. The top builders in Denver are currently Richmond American Homes, Lennar, and Clayton Properties Group, who collectively make up roughly 35% of the market. Don’t be surprised to see the seasonal slowdown in the May and June data. In 2016, the average sales pace slipped 13% from April to June and dropped 27% during the same months in 2017. Our latest feature in Zonda lets you instantly visualize a heat map of the average new home sales rate by market. We pulled Denver to understand submarket strength, and found that Adams County has the best sales rate in the metro area. The aforementioned top builders for the metro are also quite active in Adams County. The best-selling project is Carriage House at Riverdale by Oakwood Homes, where clustered single-family detached homes start at $340,000. The Coloradan condominium development is the best-selling active new home project in the Denver CBSA. Standing at 19 stories tall, the building includes ground-floor retail, 294 market rate homes, 33 affordable homes, and seven penthouses. Opened less than a year ago, the community is over 80% sold out. Furthermore, their best-selling residence type is the studio unit. 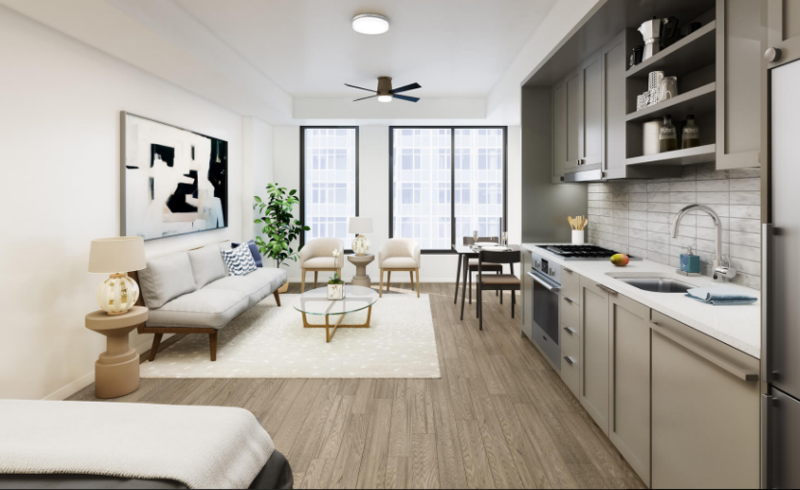 The 49 studios are now sold out, but ranged from 485-534 square feet and sold primarily to Millennials (mostly mid- to late-20s) for under $300,000 (some units went for more). Just two of the 113 one-bedrooms remain unsold. Best location in town. The Coloradan benefits from its location in downtown Denver practically adjacent to Union Station. The area is walkable to main employment hubs, and once development is complete, ground-floor retail will include a boutique fitness center, a coffee shop, bar, restaurant, dry bar, and more. There’s already a Whole Foods across the street. The Whole Foods was added because of the scale created by the abundance of for-rent communities in the area. Limited competition. Condo development has been nearly non-existent for the past 10 years in Colorado. The Coloradan stands as just one of four actively selling communities in the Downtown Denver submarket. Roughly 95% of their traffic comes from online appointments. All-encompassing. The Coloradan attracts a broad range of buyers with the exception of most families. Given the price point, location, and lifestyle, the luxury high-rise product appeals to empty nesters, singles, dual income no kids, existing condo owners, transplants, and investors. We analyzed contract sales by market in absolute terms and found that Dallas leads the nation with the most year-to-date contracts, followed by Houston and Phoenix. Please let us know if you’d like to see the full list. Contact us to discuss how we can help you stay competitive in today’s evolving housing market. We cover topics around housing, policy, markets, and technology.